Residents of the north who live near the Israeli-Lebanese border were surprised to hear that Operation Northern Shield to destroy Hezbollah's attack tunnels has ended. Meir Biton of Moshav Avivim told Yisrael Hayom that "in the last half-year I've seen and photographed shaft excavations in Lebanese territory. When I heard the operation had started, I was happy. They said they found tunnels in Metula, Zarit, Shatula, and we thought they'd get to us too, but they didn't even come to see if we had a tunnel or not. "Now it's really scary. If they were at least looking, then even in wartime I'd stay home. But when I hear they finished the operation, I know I won't stay here for a second," he says. Rosh Hanikra residents also reported noise from excavations heard for at least the past two years. "There were quite a few testimonies, all relating to the same period, to the same hours when they heard noise of excavations, and the same type of noise. I understood representatives from the army came, but no drilling was carried out to confirm or deny the existence of a tunnel in our area," said Rosh Hanikra resident Gadi Shabtai. "Since then, additional testimonies have accumulated, and the army was supposed to come and meet with the residents at the kibbutz culture center, but every time the meeting was postponed and it hasn't been held until today." Orly Cohen, who works in Kfar Yuval's operations room, said yesterday, "I'm sure there are more tunnels that haven't been located. In my opinion, the declaration was intended to check it off the list before the Knesset elections. We know the IDF searched here, but no one informed us they found a tunnel. Imagine that we're in the village war room and we don't know if they found a tunnel in our area. So to say we're calm? Definitely not." The IDF Spokesman said "all the inquiries on the matter were thoroughly examined and dealt with very seriously in the IDF. The tests were carried out thoroughly and professionally, on the overt and covert levels. It should be noted that if necessary, dedicated teams arrive at the area. As part of the teams' activity at the site subterranean noises were indeed heard, but after investigation it became clear that these noises were not subterranean excavation noises, and the existence of tunnels was ruled out. "The IDF will continue to examine in depth any report that may be made, parallel to a large-scale defense effort on the Lebanese border, combining various means and technologies, and the continued construction of the defensive barrier. 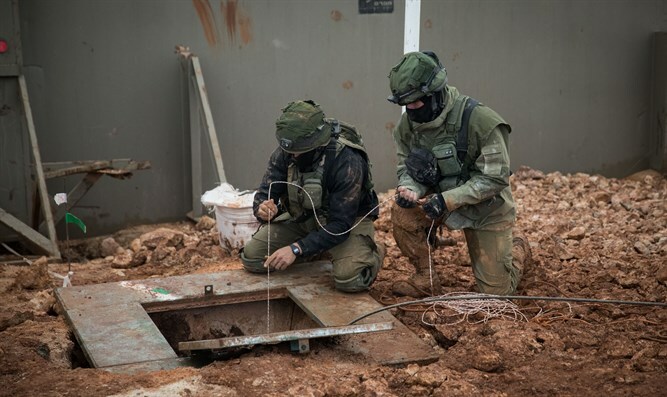 Similarly, IDF forces and the underground detection laboratory will continue to operate regularly along the Lebanese border against underground activity."